Catalonia, the next state in Europe? On Tuesday 11 September, an estimated 1.5 million people joined a demonstration in Barcelona, marching under the slogan of ‘Catalonia, the next state in Europe’. I say ‘marching’, but ‘attempting to march’ might be closer to the mark, because the streets were so packed that most people finished up just a few metres from where they had started. Despite this claustrophobic situation, the demonstration apparently concluded without one single incident. 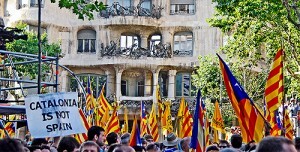 11 September is Catalonia’s national day, and mass celebrations are common. Until this year, the most famous example took place in 1977, when more than one million Catalans marched for regional autonomy shortly after the demise of the dictator Francisco Franco. Decades after achieving that autonomy their cry has changed – ‘In-inde-independència’ – and there is little doubt that it has been heard loud and clear. Support for Catalan independence has more than doubled since 2005, thanks to a series of events that began with the frustration of Catalonia’s attempts to substantially strengthen its autonomy, having to accept instead a watered-down version of its new Statute that even then was challenged in Spain’s Constitutional court. Added to that disappointment is the effect of the global financial crisis on ordinary Catalans – who see their taxes disappearing into a Spanish black hole, never to return to Catalonia – and the election to power in Madrid of a party (the Partido Popular) that has strong centralising tendencies and encourages the anti-Catalan rhetoric of Spain’s right-wing media.